Ensemble Offspring mix Scottish and Australian composers premièring a work by Matthew Whiteside and Kate Moore along with Jane Stanley ‘Four Dessert Flowers’, Thomas Meadowcroft ‘Medieval Rococo’ and Andrea Keller ‘Love in Solitude’. Based in Sydney, Ensemble Offspring is led by acclaimed percussionist and founding member Claire Edwardes, and features a core line-up of six of Australia’s most well-regarded and eclectic musicians: Lamorna Nightingale (flute), Jason Noble (clarinet), Véronique Serret (violin), Blair Harris (cello), Bree van Reyk (drum kit & percussion) and Zubin Kanga (piano). Outside of Ensemble Offspring, members might be found performing with choirs, collaborating with singer-songwriters, joining dancers on stage or performing concertos with world class orchestras. The group frequently expands to include other instruments, as well as conductor Roland Peelman, and collaborates across genres and art forms, including theatre, popular music, dance and opera. Recent collaborators include Mike Patton, Urban Theatre Projects, Amanda Brown, The Song Company and Sydney Chamber Opera. With the creation of new work at the heart of Ensemble Offspring’s activities, the group constantly commissions composers through its Noisy Egg Creation Fund and works regularly with emerging and established Australian composers such as Andrea Keller, Mary Finsterer, Matthew Shlomowitz, Michael Smetanin and Kate Moore and international composers including Michael Norris, Simon Steen-Andersen, Louis Andriessen, Michael Finnissy and Genevieve Murphy. In 2017 the group presented a full year of works by female composers including twenty seven world premieres. Each year Ensemble Offspring’s Hatched Academy provides opportunities for the very best emerging performers and composers from around Australia. Alongside regular national touring commitments, Ensemble Offspring has performed extensively in Europe and Asia and was ensemble in residence at the 2015 Shanghai New Music Week and 2010 ISCM (Sydney). In 2016, the group won the Art Music Award for Excellence by an Organisation, presented by APRA/AMCOS and the AMC. In the same year, Artistic Director Claire Edwardes was awarded the Award for Excellence by an Individual for her outstanding contribution to Australian music. The Secret Noise, composed by Damien Ricketson and presented by Ensemble Offspring, won the 2015 Art Music Award for Instrumental Work of the Year, and the same award was won in 2018 by Lisa Illean’s Cantor (after Willa Cather), performed by Ensemble Offspring as part of their 2017 Year of Women Composers. In 2015 the group was a short listed in the Classical Next: Innovation Award, and selected to perform in 2019. Now in its twenty fourth year, in 2015, Ensemble Offspring celebrated 20-years of championing new and innovative music, showcasing the astounding journey the group has taken from a student ensemble co-founded by composers Matthew Shlomowitz and 20-year artistic director, Damien Ricketson, to the internationally esteemed ensemble it is today. Claire is an internationally acclaimed percussion soloist, chamber musician and Artistic Director of Ensemble Offspring. She is the only Australian musician to win the APRA Art Music Award for Excellence by an Individual three times (2016, 2012, 2007), is the recipient of an Australia Council and Freedman Fellowship and the winner of numerous European instrumental and percussion competitions as well as 1999 Australian Young Performer of the Year. Recently appearing as soloist with the Melbourne Symphony Orchestra at the Myer Music Bowl and on Play School to an audience of thousands of children, Claire is passionate about percussion and new sounds being widely disseminated. Lamorna is a core member of Ensemble Offspring and has been performing with the group since 2007. She appears regularly with the Sydney Symphony Orchestra, the Australian Opera and Ballet Orchestra, and the Australian Chamber Orchestra and as a guest artist with The Song Company, Synergy Percussion, Halcyon and Kammer Ensemble. Lamorna enjoys exploring and disseminating new repertoire for flute and has worked closely with Australian composers Damian Barbeler, James Humberstone and Jane Stanley. She has initiated and performed on two recordings of new Australian flute music ‘Eat Chocolate and Cry’ and ‘Spirit of the Plains’ and has created several pedagogical volumes of repertoire for young flute players through her publishing company, Fluteworthy. Jason is an in-demand Bondi clarinettist specialising in all members of the clarinet family including the bass clarinet, saxillo, clarinis and glove bagpipe. He has been an integral member of Ensemble Offspring since 2002 featuring in such projects as Bargain Garden, Fractured Again and The Secret Noise. Jason has twice travelled to the Afghanistan National Institute of Music in Kabul as an educator and clarinet teacher. He has collaborated variously with popular musicians Sally Seltmann and Holly Throsby, the indigenous women’s choir of the Tiwi Islands and most recently performed with Nick Wales and the Shaun Parker Dance Company in the production ‘Am I’. Jason performs regularly with Halcyon, soprano Jane Sheldon and The Song Company. Zubin is a London-based Australian pianist and researcher. He has performed at many international festivals including the BBC Proms, Cheltenham Festival (UK) Melbourne Festival, Metropolis Festival (Australia), IRCAM’s Manifeste Festival (France) and Borealis Festival (Norway) as well as appearing as soloist with the London Sinfonietta, and the Melbourne Symphony Orchestra. He is a member of Ensemble Offspring and has collaborated with many of the world’s leading composers, including Michael Finnissy, George Benjamin, Steve Reich, Thomas Adès, Damien Ricketson, Liza Lim, Michel van der Aa and Stefan Prins and premiered over 70 new works. He is a post-doctoral researcher at the University of Nice and IRCAM, Paris and a Research Fellow at the Royal Academy of Music, London. Versatile percussionist, multi-instrumentalist and composer, Bree van Reyk has been a member of Ensemble Offspring since 2002. Her unique musical skills have allowed her to forge a career that spans from that of percussionist with Synergy Percussion, to drum-set player with Paul Kelly, Holly Throsby, Lior, Darren Hanlon and many more. She has toured throughout Europe, Asia, Scandinavia and the United States and has recorded in Sydney, Shanghai, Nashville and New York. Recently graduating from AFTRS she is also a composer of music for film, and has been commissioned to write live and electronic soundtracks for Shaun Parker, Sydney Dance Company, Bell Shakespeare Company, NOMAD Percussion and designer Bianca Spender. Blair Harris is considered to be amongst the pre-eminent cellists in Australia. Blair holds a Bachelor of Music from the Queensland Conservatorium and is a Fellow of the Australian National Academy of Music. As a soloist he has performed with both the Melbourne Symphony Orchestra and Orchestra Victoria on numerous occasions. He has also appeared as Principal of the Melbourne Chamber Orchestra, Guest Principal with Orchestra Victoria and Guest Associate Principal of the Tasmanian Symphony. Blair’s true passion lies in the chamber music realm. From 2010-2017 Blair was a member of the Helpmann Award nominated ensemble Syzygy, currently artists in residence at the Melbourne Recital Centre. 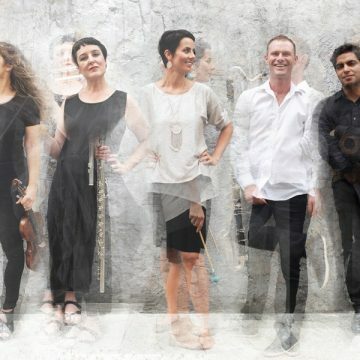 Blair has collaborated with many of Australia’s leading ensembles including the Australian String Quartet, Streeton Trio, Seraphim Trio, Inventi Ensemble and Ensemble Offspring. His numerous recordings are regularly broadcast on ABC Classic FM and 3MBS Fine Music. Blair currently plays on a very fine cello by renowned modern luthier Adrian Studer.